This season’s flu vaccine was almost completely ineffective in people 65 and older, which could explain why rates of hospitalization and death have been some of the highest ever recorded for that age group, according to early estimates released Thursday by the Centers for Disease Control and Prevention. Doctors, researchers and public health experts are already bracing for an onslaught of new patients by developing drugs and preparing caregivers for the emotional and physical stress. Vice President, HomeCare, Inc., a home care provider in the Merrimack Valley, Northeastern Massachusetts and Southern New Hampshire. To learn more visit their web site at www.HomeCareInc.org. The cold and snowy winter months can be challenging for many people. A trip outside, even for a brief errand, can be both difficult and dangerous. The winter can be especially treacherous for the elderly, who are at risk for broken bones from falls on ice, breathing problems caused by cold air, hypothermia and frost bite. Many hold less body heat due to a slower metabolism and reduced physical activity, so they feel the cold more severely. And, as people age, the ability to feel changes in temperature decreases, making it important for elders to monitor the house temperature and to dress in layers. For the elderly, the winter months can also be long and lonely. With the holidays over and family members back to work and family responsibilities, January and February can be especially lonely months for the elderly who find themselves homebound with fewer social activities and outside contact. So what can you do to help an elderly family member, friend or neighbor reduce the isolation and loneliness of winter? Make it a New Year’s resolution to visit once a week for a meal, cup of coffee or just to socialize for an hour or two. Encourage other family members to visit, call or e-mail on a regular basis. Contact your local senior center or community center to check for opportunities for group meals, social programs and outings, or even friendly visitor programs. Buy, fill and hang a bird feeder in a backyard or attach it directly on a window. Birding activity can be very entertaining and a great topic for conversation. Check the local library for a mobile book loaning program, or offer to pick up and drop off books and magazines. Send a letter. An old-fashioned letter in today’s age of electronic communication can mean a lot to the elderly and bring a sense of anticipation while awaiting a mail delivery. Enclose a couple of pictures for added enjoyment. Plan an occasional outing for lunch, a trip to the barber or hairdresser, or for some shopping. Finally watch for signs of depression. The elderly are at increased risk for depression due to life changes, medication and illness. By: Patricia O’Brien, MBA, MS, RN, Executive Director of Hebrew Senior Life. Re-posted with permission from Hebrew SeniorLife Blog. A loose railing. A dusty table. Expired milk in the refrigerator. These can all seem like simple problems, but may actually be signs of bigger issues for seniors. That loose railing can mean difficulty making it up stairs. Ignored dust can hint at eye sight trouble or that house work has become too strenuous. Expired food can mean a senior is not getting the right nutrition or simply needs help getting to the store more often. It’s these small things that affect a senior’s quality of life in a big way. I’m proud that our staff at HSL is trained to immediately notice issues, big and small, and offer advice to improve a myriad of situations relating to senior home health care. Within five minutes of visiting a senior, home care professionals have completed an environmental assessment that includes potential safety risks or signs of potential problems. The “Nurse Delegation” bill (S.1138, An Act Relative to Home Health Aides) has been stuck in the Joint Committee on Public Health since it was among a list of other matters that had a public hearing last July. The Home Care Alliance’s Legislative Action Center now includes an email message that can be sent to the committee urging them to advance the bill forward in the legislative process! Just follow the instructions on this link to take action. 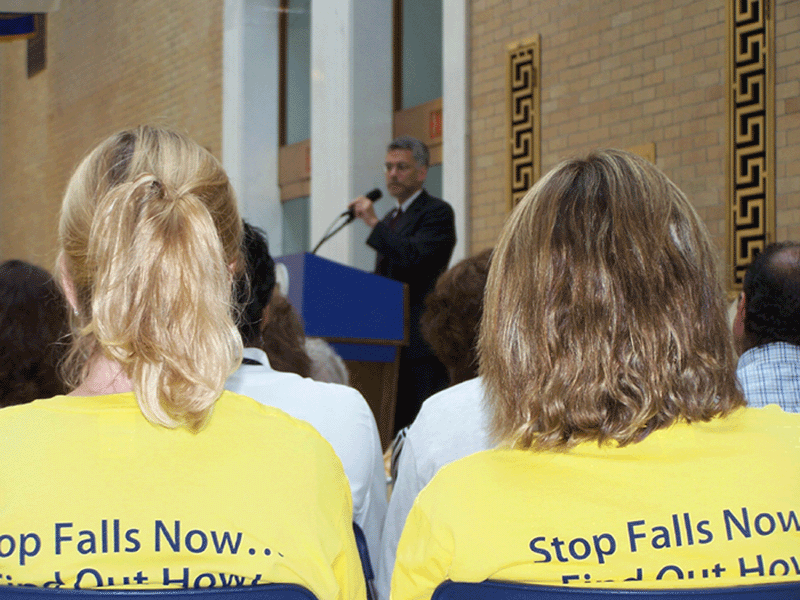 This year’s Falls Prevention Awareness Day will be taking place from 10:00am to 12:00pm on September 22 in the Great Hall of the Massachusetts State House. The event will feature speeches by State Senator Richard Moore and Executive Office of Elder Affairs Secretary Ann Hartstein. Once again, clinicians, community activists, state officials and honored guests will gather to raise awareness that falls are both common and costly. Efforts are in place in our state to introduce falls prevention activities across the health care continuum and into the daily lives of older adults. Join the Massachusetts Falls Prevention Coalition and our experts to help prevent falls across all settings. Presentations will be made by the VNA of Boston and other providers with falls prevention programs. Attendance is free and there is no registration for the event. Simply RSVP to James Fuccione at HCA (jfuccione@thinkhomecare.org) or Alissa Weintraub at Mass Senior Care (aweintraub@maseniorcare.org). The mission of the Massachusetts Falls Prevention Coalition is to promote healthy lifestyles, behaviors and strategies to reduce the incidence and severity of falls and fall related injuries across the lifespan in Massachusetts.